Soups are a great accompaniment to any meal and makes for a satisfying experience. Delight your taste buds with this Easy Creamy Tomato Soup made with only some simple ingredients. Tomato soup is a soup made with tomatoes as the primary ingredient. It may be made in a variety of ways. This is the most luscious soup I have ever had. There are many ways of preparing tomato soup. I have kept my recipe very simple and yet delicious. However, to make it more flavourful, you can add onions, garlic, carrot and some fresh herbs. Adding herbs enhances the flavours as well aroma. 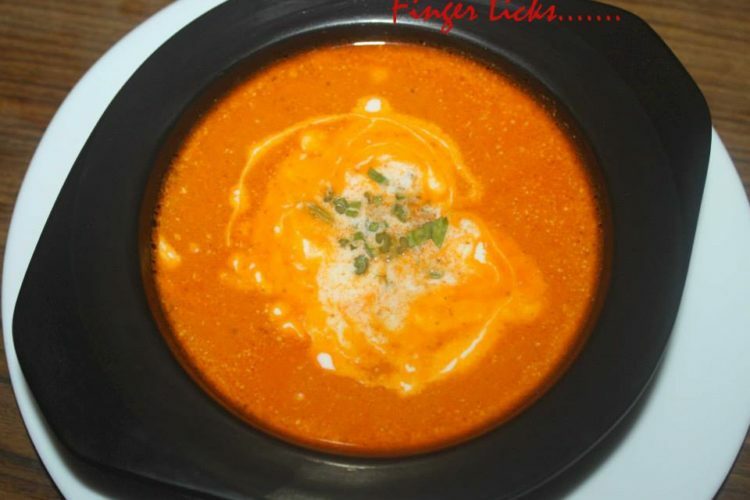 Crushed black pepper and fresh cream makes the finishing touch to your rich classy tomato soup. Actually this is an adapted recipe. I really thank the cooking legend Sanjeev Kapoor for this unbeatable soup recipe. This is adapted from his recipe book and I should say it is worth to steal. Mix sugar and cream gently. Heat the oil and butter in a deep non stick pan, add bay leaf, peppercorns and onion and sauté until translucent. Add the garlic and celery, stir fry nicely. Add carrot roundels and tomatoes, stir fry for a minute and add three cups of water. Bring it to a boil. Cook for ten to fifteen minutes and add three cups of water. Bring it to a boil. Cook for ten to fifteen minutes covered with a lid. Strain the mixture through a strainer. Reserve the liquid. Remove the peppercorns and bay leaf from the residue and allow it to cool. Blend in a mixer to get a smooth puree. Pass it through a sieve or strainer. serving stir in cream and sugar mixture. Serve hot.